Protestors with DefenDemocracy of CT showed out in support of DACA on the Ruth Steinkraus Cohen Memorial Bridge in Westport, Conn. on Sept. 14, 2017. WESTPORT — Ruth Steinkraus Cohen spent her life as an advocate, passionate about the United Nation’s mission to bring unity and human rights to all. Cohen served as secretary to Eleanor Roosevelt, an active member of the World Federation of the United Nations Association, a nonprofit dedicated to connecting the UN to the people. She also arranged for UN members to learn about America by visiting local homes. Although she died in 2002, Cohen’s legacy of advocacy work reigns strong on the Westport bridge named in her honor. Traditionally a spot for Westporters to make their voices heard, the bridge has been the home of three protests held by DefenDemocracy of CT, a group started in wake of the Women’s March on Washington in January to help promote activism in the community. Hicks said she was inspired to start DefenDemocracy of CT after traveling to the nation’s capital for the Women’s March. Hicks called together a group of women to come over to write postcards to local legislators urging them to take action on certain issues. A group of 10 quickly quadrupled to 40, which was the beginning of DefenDemocracy of CT.
Hicks proceeded to set up a Facebook page for DefenDemocracy of CT as a way to organize people interested in taking action. The group now has 375 members and expanded beyond the borders of Hicks’ town. When Trump pulled out of the Paris climate accord in June, group members gathered on the Ruth Steinkraus Cohen Memorial Bridge with signs to draw attention to the situation, in addition to calling their legislators. 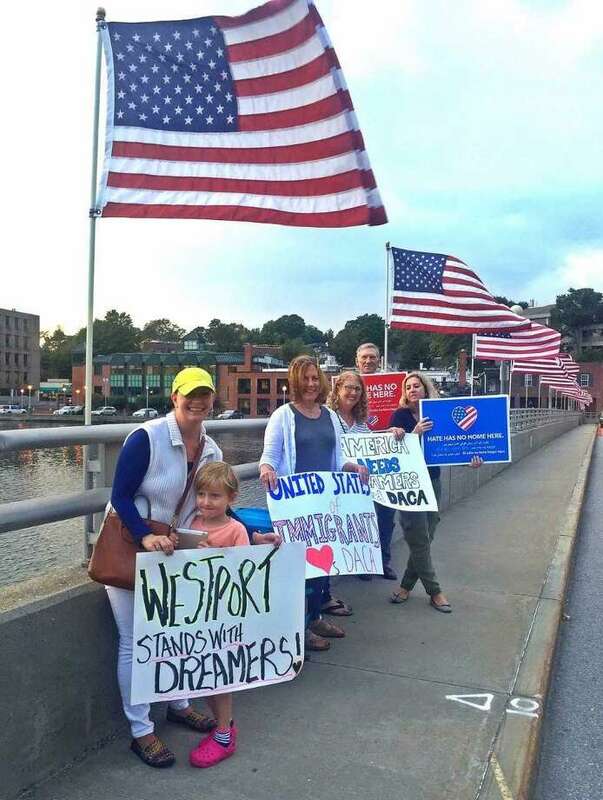 They once again convened on the bridge spanning the Saugatuck River following the White Nationalist rally in Charlottesville, Va. in August and most recently, they went out for an hour in rush-hour traffic with signs calling for support for the Deferred Action for Childhood Arrivals program. From 5 to 6 p.m. Sept. 14, about a dozen protestors held up signs to catch the eye of commuters, calling for support of the program implemented during former President Barack Obama’s administration that allows young immigrants living in the country illegally who were brought here as children to remain in the U.S. The “pop-up protest,” as Hicks described, it resonated with many people, including two self-described “Dreamers” who stopped their cars to come and hug the group. “Every issue is supported,” said Aarti Khosla, who owns Le Rouge Chocolates by Aarti, a chocolate shop on Main Street. Khosla and came out to protest against DACA being rescinded. In addition to contacting legislators and organizing pop-up protests, DefenDemocracy of CT also organized the CT on the Move march where several politicians spoke, including U.S. Rep. Jim Himes, D-4, U.S. Sen. Richard Blumenthal and U.S. Sen. Chris Murphy. The March 26 event, which followed the same path suffragettes in Westport marched a century earlier, yielded about 1,000 protestors from all over Connecticut. Hicks decided to organize the march after initiating the postcard-writing movement. The Westport woman has long been involved with protests, rallying against apartheid back in college. She, along with Westport residents Lauren Soloff, Mita Prasad and Lisa Bowman, wrote emails and put out advertisements to organize the march and were pleasantly surprised by the outcome. Hicks, who moved to Westport with her mother when she was 10, said the reception to the bridge protests has been mostly positive with many people driving by honking, waving or giving thumbs up. She said the group even brings extra signs, because parents will sometimes pull over and take their children to the protest as a lesson in democracy. But she said there have been a few dissenters. “People are uncomfortable with discussion,” she said. “That’s really the long and short of it. People don’t like that we go on the bridge because it’s an ugly representation of town and it makes us look less beautiful. I don’t know what they want the town to look like, but they don’t want there to look like there’s trouble, but we can say we want things to be different. However, Hicks said she welcomes the angry fists they occasionally get.